is ‘Diada Nacional de Catalunya’, i.e.. the ‘National Day of Catalonia’. This day is to honour and memorialize the Catalan troops that fought during the War of the Spanish Succession. They commemorate that in 1794 Catalonia lost all her rights for independence and the loss of their culture. At first a day of mourning, during the years this day, has become more and more a day with a festive character. In 1980, it was first called an official holiday in this region. The schools, shops and most of the companies are closed to celebrate this day. People are outside, walking with friends and family through the streets, with the Catalan flag around their necks, as real proud troopers. Yesterday the Catalans, dressed in yellow/red t-shirts, joined hands and created a huge human chain, 400km long, demanding independence from Spain. 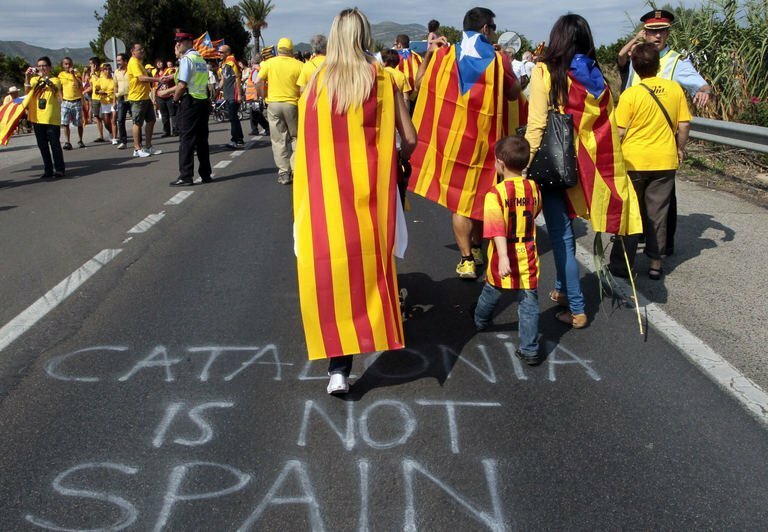 The Catalans are proud of their language and culture, but suffering in a recession, many of the Catalans feel they are paying for the crisis of Spain. More than half of the 7,5 million Catalans, want independency. Today, only the amount of catalan flags, outside the windows, seem like a vague memory of yesterday.